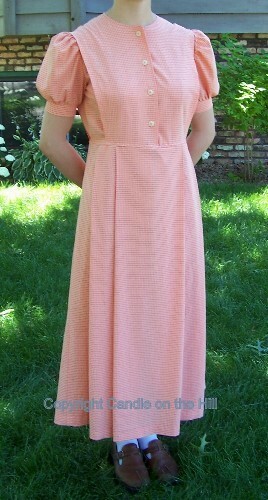 From our Candle on the HillTM line of patterns comes this classic button-front dress in a simple, modest design! Dress has button-front bodice (snaps, pins, hook & eyes, etc. could also be used), choice of collar or plain neckline, pocket option, full skirt that could be gathered or pleated, simple bust darts for a gentle fit, and choice of elastic or non-elastic waist. This dress is similar to the Country Classic, the difference is that this dress has an attached cape over the front and back bodice, and an optional concealed nursing option! 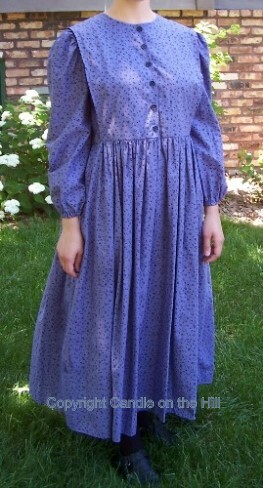 This is dress is worn by many "plain" or conservative Mennonite and Brethren ladies, but is also a favorite of many other ladies due to the modest, comfortable, fit and design. The Country Cape Dress is a favorite! Includes Ladies Sizes Small-XXLarge! !